Can I write story in English too? Thanks. This is a blog where we feature many new artists .. My personal blog is radiant-raindrops.blogspot.com if you’d like to read. Is note k khyal ki shuruaat tab hui jab dimag aaj se 6 7 saal peeche gaya when I entered world of twitter and through a forum #Shair, aapa (@iamrana) opened a new world for us..which introduced me to some of finest souls in my life including skb, inder bhai, gaurav, vivek, atulji etc..whose friendship I treasure..a lott.. Thanks a lot skb for this. .
Oye Rahul, paani chala jaayega ! A letter like this is like a chicken soup for my bones.. It doesn’t just make me feel warm and satiated but it also uplifts my mood and fills me mind with new horizons to reach to .. I am so proud of my ASMandali.. do you know how far we have come as a group of writers.. I see such incredible talent around .. The writing level has become better. our thoughts are more streamlined.. I also think the honest feedback from the guest editors have shaped the writer’s group in such a commendable way ..
You, and Vivek have been so kind in giving visual and artistic inspiration to the writers..
Inder has been so instrumental in filtering my thoughts.. He has helped me maintain the quality of this forum ..
Rana Aapa is my soul guide and she helped me channelize my thoughts and words and I am just paying it forward. And last of all.. the writers.. This platform would not have this light had it not been for the writers with such an utter passion for learning and that undying need for expression.. 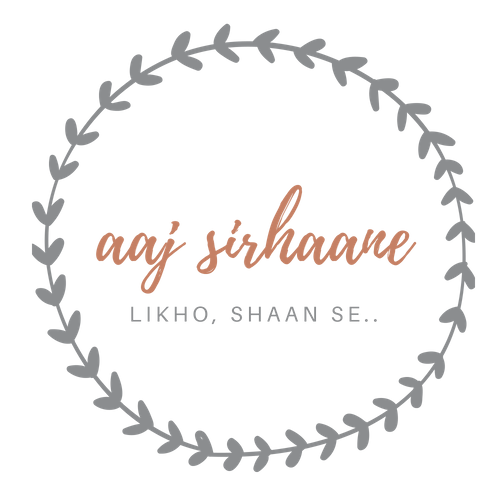 Thanks to you .. Aaj Sirhaane has extended itself even further than me and has a soul of its own.. Thank you Rahul for such a lovely write up and kind words for me. It is s pleasure meeting you here. Hey Nirmal, a friend like u is an asset, and your talent us divine ! Stay blessed dear!! बस ये मेरे मन की बात, और बहुत से मित्र हैं सबसे मेरा नमन…. Heartfelt echos to all the views expressed for Aaj Sirhaane and sincere gratitude to SKB for her drive and dedication for this endeavor. Admiration for her magnanimous handling of the medium that provides a forum for all of us to participate and prosper and not simply compete and conquer. Be it poetry, prose or any other genre of creative pursuit, finding an audience is the hardest part sometimes. Thanks to Aaj Sirhaane for facilitating the path of expression, for bridging the gap between the artist and audience. अनुराधा जी को ये कहते हुए बड़ा अच्छा लगता की अरुणा mam loves me more पर हम सब जानते mam loves us all . राहुल और वरुण भाई i love you . AS Mandli का पंजीकृत सदस्य नहीं हूँ पर जिस तरीके से आप और आपके योग्य सदस्यों के बीच partcipate करता हूँ, मैं स्वमेव खुद को इसका हिस्सा मान बैठता हूँ. ‘आज सिरहाने’ मण्डली से जितने भी लोग जुड़े हुए हैं, उनका प्रशंसक मैं पहले से से ही हूँ और मेरा सौभाग्य है कि इनमे से अधिकांश आज मेरे दोस्त हैं.. सभी एक से बढ़ कर एक. अपनी रचनाओं पे..बरबस तालियां बजवा लेते हैं, मुंह से ‘वाह’ खींच लेते हैं और मैं खुद को रोक नहीं पाता. अनुराधा जी ! जिस तरह से नए पुराने सभी लोगों को एक सूत्र में पिरोया है आपने वो काबिल-ए-तारीफ है. आपकी ‘शाबासियां’ पाकर सब और निखर उठे हैं. अपनी अन्य वयस्तताओं में से आज सिरहाने के लिये वक़्त निकालना भी मामूली बात नहीं. मेरी प्रशंसा और शुभकामनाएं स्वीकार करें ! पुनश्च : कल मैंने फॉर्म भरा है, स्वीकार हुआ है या नहीं.. अज्ञात है. Initially I was hesitated but with time and love n encouragement from anuradha mam, I am now a part of this family. I m happy and I know it so I m clapping clapping clapping…..
Thanx anu mam for ur efforts to add a new aspect to my life. I’ve met many people in life but you guys are special, not only because you are #ASMembers but because you all are a rare specie. You’ve brought unimaginable warmth and joy to life. I think we were destined to be family and i am grateful to #AS that has brought us together. May you all Smile more often and brighten this world. A special thanks to Anu mam for creating AajSirhaane. You are an angel who has diminished all the darkness from my life. #AajSirhane has happened to be the best thing of this year. I have been the most inconsistent member of this family. I am glad, i’ve not been externed for “taking more and giving less” to the family. May the Train takes in all the passengers. एक लिफ़ाफ़ा मेरा भी …. दबी हुई अभिवयक्ति मुखर हो रही है निखर रही है !! कलम के जादूगर अपने नायाब करिश्मे दिखाते है ! Visited the web page on the computer after a long gap and am delighted to see the massive leap AS has taken within a short span. It feels great. Kudos…!